Pabellón criollo is a traditional Venezuelan dish, the local version of the rice and beans combination found throughout the Caribbean. It is a plate of rice, shredded beef and stewed black beans that is considered by many to be the Venezuelan national dish. Left: Pabellón criollo con barandas. Common additions include tajadas (fried plantain slices) or a fried egg. Both of these variants have acquired slang names. 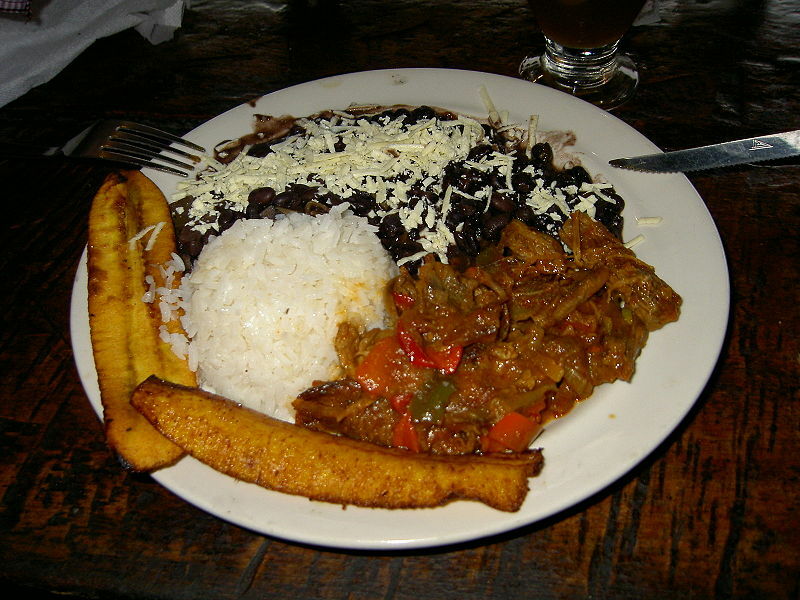 A pabellón con barandas (baranda is Spanish for guard rail) is served with tajadas because the long plantain slices placed on the sides are humorously considered to be keeping the food from falling off from the plate. A pabellón a caballo (a caballo is Spanish for horseback riding) means with a fried egg on top, as though the egg were "riding" the dish. Most waiters understand immediately what is meant by Pabellón con barandas y a caballo. The shredded beef can be replaced by chigüire (capybara), caiman shredded meat or even freshwater fish, depending on particular tastes, region or time of the year (beef consumption is prohibited by the Roman Catholic Church during Lent, however capybara and fish are approved).